Air Canada (TSE:AC.B) (PINK:AIDIF) is building up trading volume as the stock price slowly progresses up, powered by the latest quarterly results announcement. 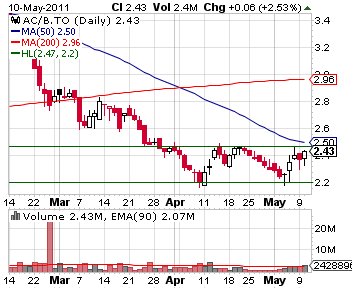 The downtrend that has dominated for over half a year has stopped at the support of $2.20. The last couple of price bounces didn't go far, creating a resistance at 2.47 and putting the price in a trading channel. This is a favorable setup for swing traders as the possible resistance bounce might provide a nice short selling opportunity for bears. The outlook for 2011 remains influenced by the rising fuel prices, however, the general sentiment remains positive. System wide capacity (measured by available seat miles) is expected to increase 3.5 to 4.5% over 2011, 1% lower than previous expectations, while domestic capacity is expended to fall 0.5% from 2010 levels.